New Brisbane projects stall with two years’ of units on market. Just one apartment development has launched in Brisbane this quarter, the fewest since March 2009, as enough units remain for sale off the plan in the inner city to supply the market for almost two years. Cbus Property’s 443 Queen Street was the sole apartment development to launch across inner Brisbane from April to June. It has been a volatile time for the Brisbane market as the off-the-plan boom of 2014 to 2016 returned sharply to lower trading conditions. Sales this quarter were 60 per cent lower than last year. There has been a big change very quickly and this is the new normal. We’ll be here for about 12 months. There are a number of factors involved in that. The big one is lending conditions and the ability of people to take large-scale projects to market and the ability to sell off the plan. Those two factors combined have put a lot of things on hold. At the market’s peak, developers in inner-city Brisbane released 23 projects in six months, including 12 developments in the March 2016 quarter, to add 3327 units to the sales market. From June 2014 to the end of December, 17 projects were launched totalling 3487 apartments. According to the report, there is an existing supply of 2260 units, representing 23 months’ worth at the current rate of sale. 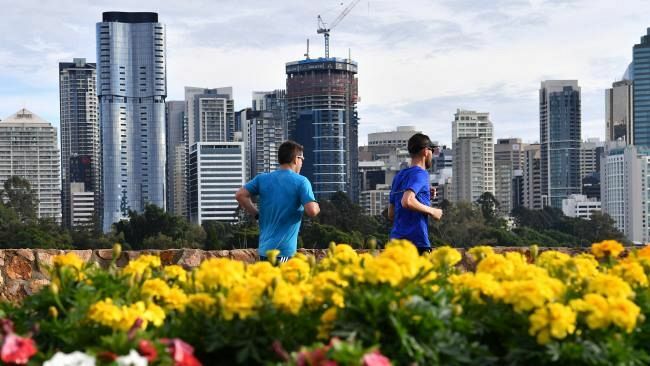 Senior finance and property figures have raised concerns over the level of supply in some sectors of Brisbane’s apartment market, including the Reserve Bank and Stockland chief Mark Steinert. Most analysts predict the slowdown to be temporary given the dramatic cooling in unit building and approvals. Walker Corporation has also reconfigured a major city fringe development from residential to office and the Seymour Group has shelved an inner-city apartment development. The Place report found the highest selling development was 48 transactions for the new release, 443 Queen, a subtropical-themed high-rise in the central business district where the weighted average sale price so far has been more than $1 million. Across the CBD, the average sale price was $969,643. The second-highest number of sales, 47, was recorded at Chinese developer R&F’s Brisbane One apartment twin towers. The median price of the apartments sold in Brisbane increased 27 per cent from last year to $744,097, reflecting greater skew to the owner-occupier market given the investor retreat. They expect that the remainder of 2017 will bring some challenging periods as the Brisbane market continues to adjust to changing conditions and uncertainty.